Now Hiring - Plumbing Engineer / Designer! Applied Engineering Services, an Indianapolis-based consulting engineering firm, is pleased to announce the appointment of Ralph Power, P.E., as President. Power began his engineering career in 1981 and joined Applied Engineering in 1999. He became a Principal in 2005, a shareholder in 2006 and a member of the Board of Directors in 2013. Power’s promotion comes as part of Applied Engineering’s business transition plan, which was initiated in 2012. Frank St. John, P.E., LEED AP, who has served as President since the firm began, will remain an officer and Chairman of the Board as Power assumes the lead role of the firm, ensuring a smooth transition. 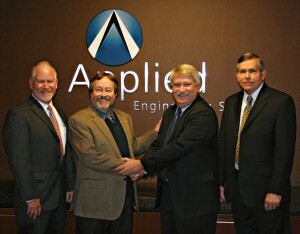 Applied Engineering is also pleased to announce two additional promotions. Brad Wertz, LEED AP, has been promoted to Senior Project Manager. Wertz is an electrical engineer with more than two decades of experience, including 10 years with Applied Engineering. Loren Horan, P.E., RCDD, LEED AP, has been promoted to Project Manager. He is an electrical/telecommunications engineer who has been with the firm since 2006. Both Wertz and Horan are shareholders in Applied Engineering.